Connie Hoover: Look Mama... I did it! Yeah, so Saturday was my very first time doing my own laundry by hand! I got to admit, I was a little scared. But Babie, my host mother, talked me through it. I'll even admit this too, she basically did everything, but I did get in and try all the steps at one point. I will be going solo next week. To do a week's worth of clothes, with both of us working, took about an hour. 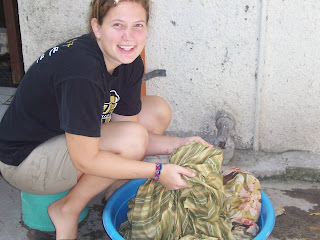 Here's the process : Pump water out of the well and soak your clothes in one tub. Pour detergent or use a bar of soap and let the clothes sit for a bit. Next you start scrubbing, and then keep scrubbing, and finally when you're done with that scrub once more. Next comes the rinsing, my least favorite part. So you pump more water into another tub, start rinsing, then you dump the water. You have to do that like 5 times until the water finally stays clean. Next you want to drip dry the clothes on the clothes line, making sure that you hang them without wrinkles, thus cuting the ironing process :) That little tidbit made me pretty happy. Lessons learned: wear fewer clothes and always bring a stool to sit on! I being a geek had to have my picture taken during this momentous event. My favorite part about this picture was right after they took it, they said, "You're not supposesd to be smiling while you're doing laundry!" That made me laugh. They need to get another maid! There's nothing wrong with doing a little bit of ironing every now and then! Just be sure to put on some moisturiser or lotion on your hands after washing. The detergent can be harsh on skin. When I went to the city to live alone without a maid, I found it to my advantage to wash clothes daily to avoid a pile of laundry at the end of the week. One more thing, I noticed that the plastic stool you are sitting on seems a bit higher. It may cause back pains. But if you're comfortable with it, then there's no problem.